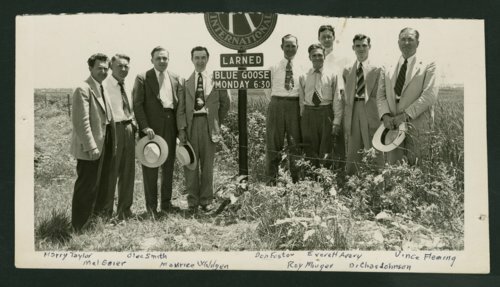 This is a photograph showing members of the Larned Kiwanis Club standing by a Kiwanis road sign near Larned, Kansas. People in the photograph are (left to right) Harry Taylor, Mel Geier, Glee S. Smith, Jr., Maurice Waldgen, Don Foster, Roy Monger, Everett Avery, Dr. Charles Johnson, and Vince Fleming. The sign indicateds that they meet on Mondays at the Blue Goose.